I was talking to my friend, LFP, and he told me about a funny thing that happened on the way to work. It started with a retriever. LFP reads electric meters in a rural area, driving a company truck from house to deer camp to trailer to house. Yesterday, a retriever started following the truck, just keeping them company. The roads were clear, but ditches, fields and driveways-in-the-shade still retained some ice from last week’s winter storm. Retriever PLUS. Driving along, retriever following, LRP drove up to the next house. It was a nice house, with a two-car garage which was open. 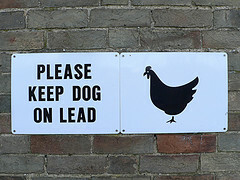 Chickens roamed freely in and out of the garage, and as you might expect, the retriever bounded after them. Now there was squawking chickens and a barking dog making a ruckus while LFP tried to get the meter read without dying of laughter. 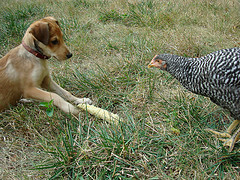 Retriever Plus Chickens Plus. But wait. One of the chickens, trying to dodge the retriever, dashed into the garage. The dog leapt after the chicken and hit a patch of ice and slid, not stopping until he hit a large trash can full of aluminum cans to recycle. Can you hear it? Chickens squawking, dog barking, cans clattering. Retriever Plus Chickens Plus Clattering Cans Plus. Oh, but it gets better. Now, a man, dressed only in boxer shorts, dashes out of the house. He carries a broom and starts swatting at the dog, protecting his precious chickens. Swat, squawk, bark, clatter. Retriever Plus Chickens Plus Clattering Cans Plus Boxer Shorts Plus. Oh, yes. The man suddenly hit a path of ice. Off balance from swatting at the poor retriever, who was just having an adventure, the man slid, lost his balance, dropped the broom, windmilled his arms, and flipped neatly, landing on his boxer shorts. Thump, swat, squawk, bark, clatter. And now laughter. LFP said it was the funniest thing he’d seen in months. What does a writer do with something like this? Laugh. And file it away for reference. Because my imagination couldn’t come up with something that good. The slapstick humor, the way the scene and event builds — what a great model for a scene in my next novel. Times like this I’m reminded how important it is to listen to real stories about what’s happening around me.